Your family will make great vacation memories in this cute, two bedroom, two bath home with a loft. Only one block from Manzanita Beach, two blocks from the golf course and 30 ft from the Manzanita bike trails, you are in the center of all that is fun! Pelican Perch features a private, wrap around deck with wetlands on one side of the property providing a unique experience close to a remarkable natural setting. The roar of the ocean can be heard from the deck and makes for a relaxing place to spend time with family and friends as well. Entering the home, a wall of windows creates a bright and inviting space that incorporates the living dining and kitchen areas. The spacious kitchen includes a gas stove, plenty of counter space and wall mounted appliances. Built-ins in the dining room are full of games and books for everyone to enjoy. The living room has a new 37" flat screen smart TV. The spacious first floor bedroom has a queen bed and attached laundry room. The main bathroom in the hall has a deep Japanese soaking tub and a walk-in, marble shower with double shower heads. As you go upstairs, you will notice the high vaulted ceilings and loft area perfect for children as there is a full futon and a pull out couch for extra sleeping. The loft has a TV and DVD player as well. It's a great space for kids of any age. The upstairs also has one queen bedroom and a roomy full bath with shower. This is a well-thought out home that works well for both adults and children. 1 dog welcome, must be at least 2 years of age and flea treated. Angela was quick to respond to a plugged toilet issue and got a handyman out to unplug it quickly as I was concerned our 12 year old would forget and use it in the middle of the night. I loved the porch and if it wasn't not as rainy would have spent more time outside on the porch. Was nice to have a covered area on the porch to take off shoes and wipe doggie down prior to entering. Great to have dog towels provided to wipe down dog after coming in from the beach or just a rainy walk. We brought our own, but having extras came in handy. The kitchen was adequately stocked to enjoy a couple cooked meals during our stay. Our family loved staying here. In fact our 4 and 7 yo boys called the home "the best in the world." We would love to come back. Scot, Danielle and Janet were all helpful and easy to book with. We had a wonderful birthday weekend at Pelican Perch. We took advantage of the bike lanes through town and into the state park. We enjoyed the block walk to the beach and the gorgeous porch and fire pit. Manzanita is intimate and idyllic, a favorite spot along the OR Coast. We will definitely be coming back! This was one of the best rentals we've ever stayed in. The beds and pillows were so comfortable! And the wrap around porch looking out onto a quiet creek was so peaceful. Add on top of that a 1 block walk to the beach, this is one place we will try and return to. This was my favorite beach vacation that I've ever had. The property was great! It was very clean and felt like a home that I would like to own. We are planning on renting the same house many times in the future. 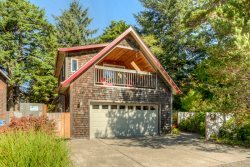 Thanks Manzanita Beach Getaway for the easy rental process and great property! No personal interaction. All online and brief but positive. Awesome house and location for our 5 person family plus grandma and dog. Very comfortable. Only drawback; no mudroom/transition area/drying room for wet, sandy, rain gear and boots for winter visitors. No where to even put your dirty shoes to dry. Fully carpeted house without any door mats. Garage was great but not heated for drying.